I really enjoy oven dishes that combine meat and vegetables, be it roast, stewed or grilled. It’s very convenient, you pack everything in a baking dish, add your spices, herbs and flavours of choice, set the right time and then relax or watch your dinner getting done. I do that sometimes, I sit in front of my oven watching the meat and vegetables bubbling and turning golden brown, it’s better than television! In the meantime you could also cook some potatoes, polenta or spaetzle to soak the juices of your roast meat but sometimes a loaf of white bread cut into thick slices is just as good. For this roast, my bird of choice is pheasant, strong in taste but difficult to cook evenly as the legs need longer than the breast. So, to avoid the meat becoming too dry, you can either carve it into pieces before you put it into the oven or you can cover (and protect) the breast with a layer of Coppa di Parma, which is how I did it here. This allows you to put a paste of spices and herbs under the prosciutto to infuse the meat. 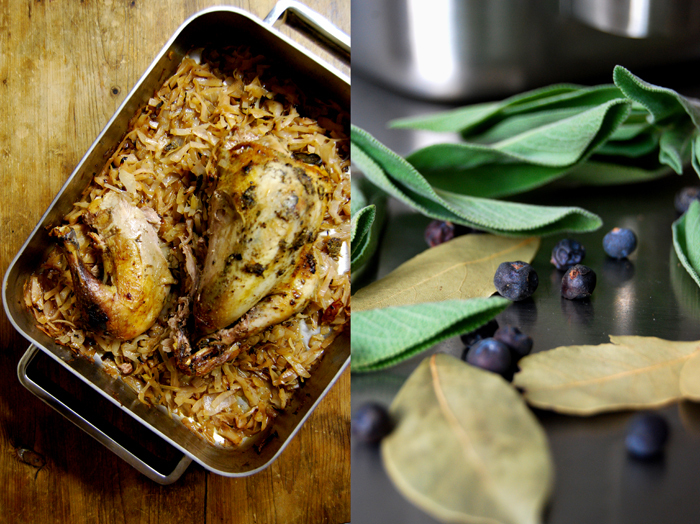 I went for sage leaves and a mixture of juniper berries, allspice, cloves and garlic. The pheasant roasted on a thick layer of chopped cabbage cooking in some white wine and the juices of the meat. It soaked the flavours and tasted wonderful, great together with the strong meat. For the spice paste, mix the juniper berries, allspice, clove and garlic. Fry the the onion in some oil until golden and soft, mix it with the cabbage, the 4 juniper berries and the 4 cloves and put in a large roasting tin (big enough for the pheasant). Add the wine and put the bird on top, glazed with olive oil and seasoned with salt and pepper. Spread the spice mixture on the breast, lay the sage leaves over it and cover with the Coppa di Parma. 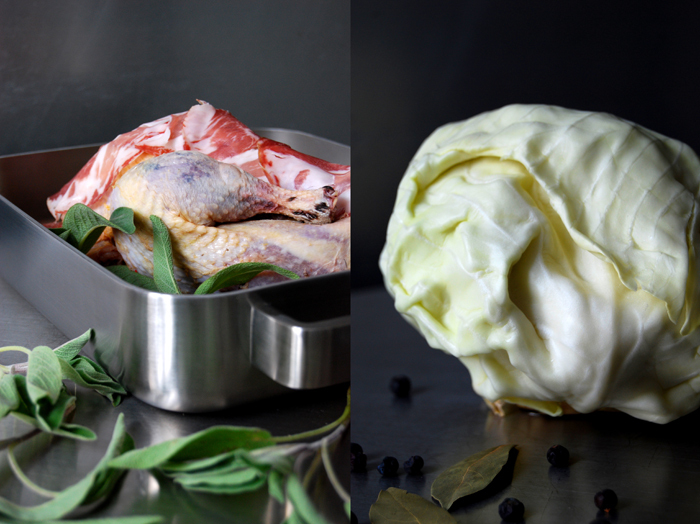 Roast the pheasant for 1 hour, pouring some wine on top once in a while and turning the cabbage. When it’s done, check with a skewer to see that only clear juices come out. I kept it simple and had some slices of white bread on the side.